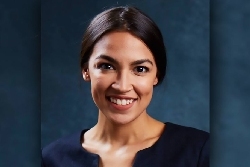 WHY WE HAVE TO TAKE ALEXANDRIA OCASIO-CORTEZ SERIOUSLY « THE BRYCE IS RIGHT! This entry was posted on January 25, 2019 at 7:00 am	and is filed under Politics. Tagged: Alexandria Ocasio-Cortez, AOC, Florida, palm harbor, Politics, The Bryce is Right, tim bryce. You can follow any responses to this entry through the RSS 2.0 feed. You can leave a response, or trackback from your own site. She’s a media darling and hardly the first or the last. Funny thing in the 14th Congressional district the Republicans just had some guy put his name on the ballot. The guy didn’t bother to even pretend he was running. She’s photogenic and I’m pretty sure everything we see in the media is orchestrated by now. Who knows if she actually had to run in an actual election whether she could get any votes? Watch the media work their magic on her. Now watch the media work their magic on her. “Mister. I’ll tell you right now that this girl is an incredible idiot. Imagine her actually TRYING to debate someone? She will get destroyed. Even other democrats don’t like her especially of what she said about immigration enforcement. She is too far left.